How to backup hard drive Windows 10 with ease? How to backup external hard drive before formatting? How to back hard drive to keep data safe? This post will show you different ways to back up hard disk with the professional hard drive backup software. Data loss has become a common issue because many reasons may lead to that, such as virus attack, mistaken deletion, sudden power outage and so on. Disk backup has become a popular way to protect users data and files. But it is not convenient and secure enough for some users to just rely on Microsoft Windows built-in ultility to keep their data safe. You may need to learn more methods about how to back up hard drive with ease. Let’s look at how to back up hard drive with the professional hard drive backup software – MiniTool ShadowMaker. It enables you to backup a file, folder, partition, disk, and even the operating system. MiniTool ShadowMaker also offers the restore service that enables you to perform some recovery solutions. For example, this feature is able to help you to restore your computer to an earlier date. MiniTool ShadowMaker is also a piece of file sync software that can help you to sync files to two or more locations. In order to provide better protection for data or automatically backup hard drive or backup files to external hard drive Windows 10, there are three important things you need to pay attention to. MiniTool ShadowMaker is able to help you to create an automatic backup so as to provide better protection. To set an automatic, you just need to click Schedule button and set the automatic backup time. MiniTool ShadowMaker provides three different backup schemes including Full backup, Incremental backup and Differential backup. The Incremental Backup is chosen by default. If you want to change the backup schemes, click the Scheme button to continue. You can also set some advanced backup parameters by clicking the Options button, such as backup compression level, encrypting the backup image and so on. To backup hard drive with Windows snap-in tool – take Backup and Restore(Windows 7) as an example. You can go on according to the following instructions. Step 1: Type Control Panel in the search box of Windows 10 and choose it to continue. 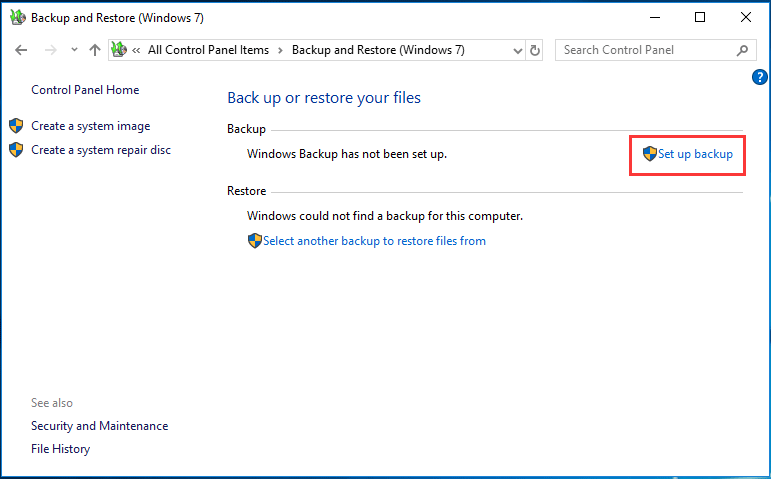 Step 2: In the popup window, change the View by to Large icons and choose Backup and Restore(Windows 7) to continue. Step 3: In the popup window, choose the Set up backup button to continue. Step 4: After that, you are required to choose a target disk to save the hard drive backup image. It is recommended to choose an external hard drive and click Next to continue. You can also save the backup image to the network location. Step 5: In the popup window, you can see there are two options including Let Windows choose and Let me choose. If you want to choose what you want to backup by yourself, the second option Let me choose should be selected and click Next to continue. Step 6: Next, you are required to choose what you want to backup. You can see that all your hard drives are listed here and check the one you want to backup. If you want to backup the operating system, please check the option Include a system image of drives: System Reserved, C and click Next to continue. Step 7: Then review your backup settings. You can see that all your data on the hard drive is chosen. And if you want to backup hard drive on a regular basis, you can click Change schedule to set the automatic backup time. Step 8: When you have finished the backup settings, click the button Save settings and run backup to start to backup hard drive. After that, you can know how to backup hard drive with the disk image software – Backup and Restore (Windows 7). With this backup image, you can restore the files if there are some accidents. MiniTool ShadowMaker is capable of cloning the disk or the hard drive. It even can help you to clone the dynamic disk, but just for the simple volume. Step 1: Launch MiniTool ShadowMaker, click Keep Trail, and choose Connect in This Computer to continue. 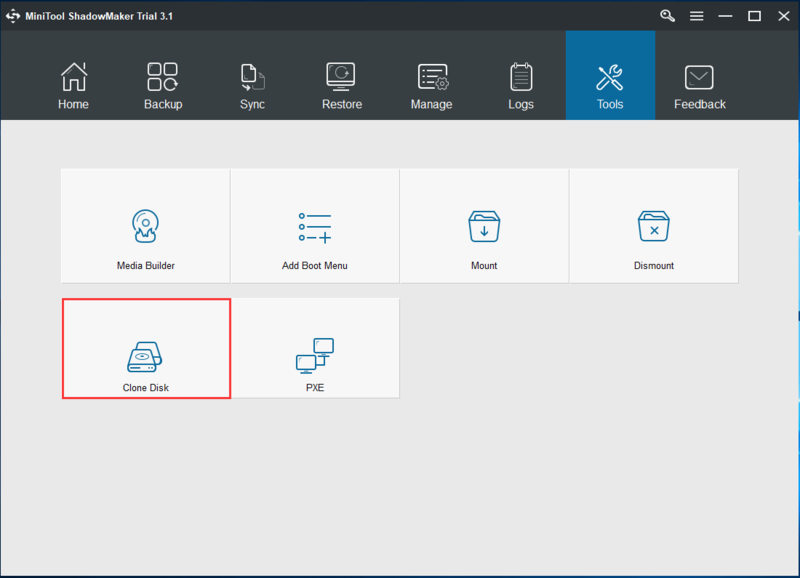 Step 2: After entering the main interface, please go to the Tools page and choose Clone Disk to continue. 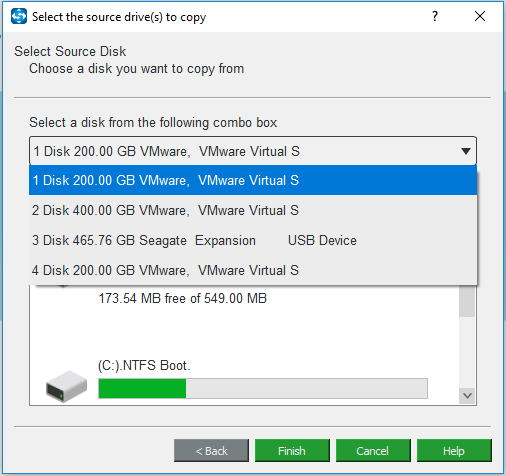 Step 3: In the popup window, click Source and Destination modules to choose which hard drive you want to backup and choose a target disk to save the backups. Then please open the drop-down list and select the hard drive you want to backup. Click Finish to continue. You can also choose to backup external hard drive. Step 4: Then choose a target disk to continue. Step 5: After selecting disk clone source and target, click OK to continue. Please note all data on the target disk will be destroyed, so backup them in advance if there are important files. Step 6: Then the disk cloning process will start. Please wait patiently for the process to be finished. Step 7: When the disk backup process is finished, you will receive a message which tells you that the source disk and the target disk have the same signature and one disk will be marked as offline if both are connected to your computer. Thus, you can choose to remove either of them when the disk clone process is finished. However, if you need to boot your computer from the target disk, please change the BIOS settings. After that, you have completed the disk backup so as to protect the data. Backing up hard drive with MiniTool ShadowMaker is more convenient and easier. Or if you have any better solution to backup hard drive Windows 10, you can share it.